Chicago Blackhawks left wing Brandon Saad with Los Angeles Kings defenseman Slava Voynov, left, and goalie Jonathan Quick in Game 5 of the Western Conference finals. As the Chicago Blackhawks and Los Angeles Kings were locked in an epic double-overtime struggle Wednesday night, I wondered about the likelihood of such a prolonged NHL battle. 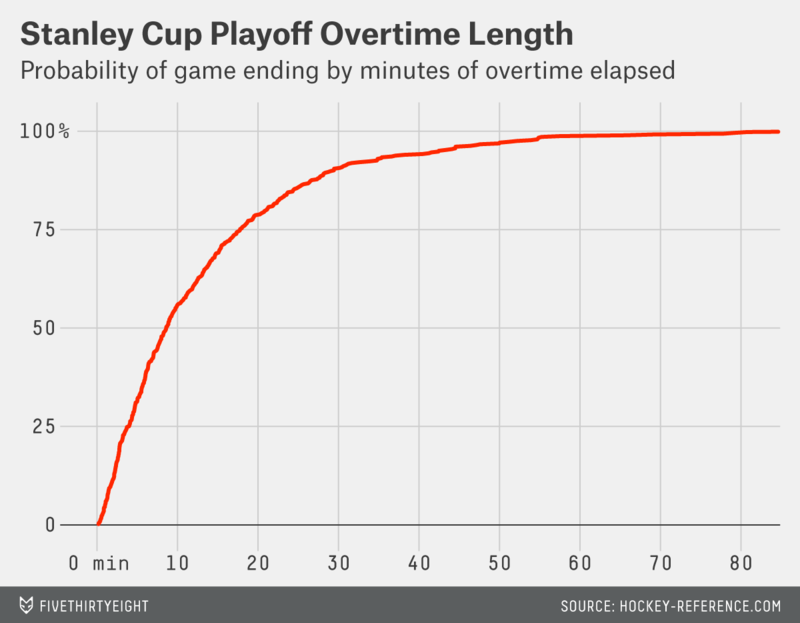 What are the odds of an OT playoff game ending after a given number of minutes had elapsed? Of course, the thrilling end-to-end playing style of Wednesday’s game would seem to make goal-scoring more likely, thereby increasing the chance of the game concluding earlier. To that end, I speculated that the amount of total scoring by both teams through the end of regulation might clue us in to the overall offensive environment of the game, and therefore play a role in whether “death” would come more or less suddenly. That hypothesis is true, although the difference is fairly small. The red curve in the chart above represents games where the total number of regulation goals by both teams was six or greater; the blue curve represents games with four or fewer combined goals in regulation. 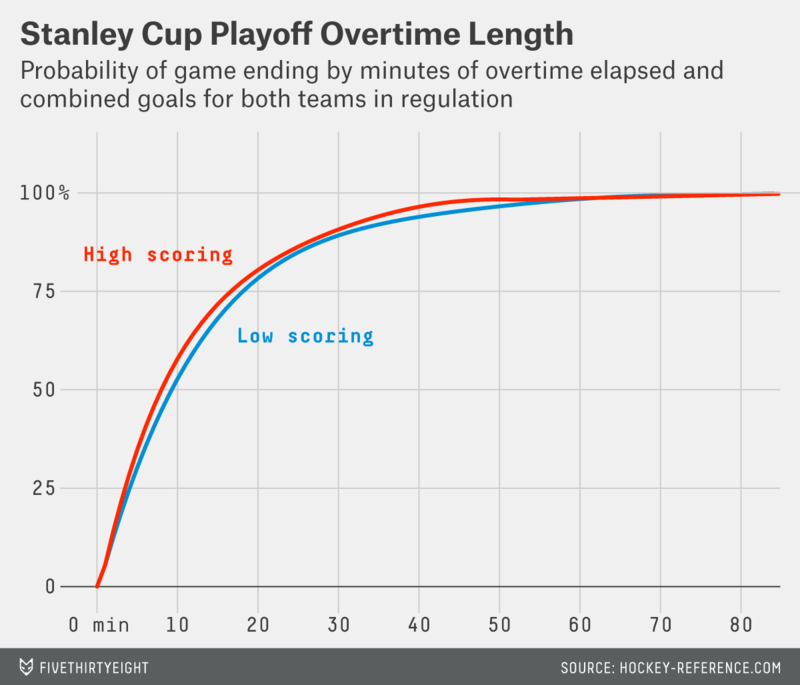 That the red line is higher than the blue for most of the chart means that, at a given number of elapsed minutes of overtime, a higher-scoring game was more likely to have ended than a lower-scoring one. (This isn’t exactly surprising, but it’s still interesting to prove it with data.) Whichever type of overtime game we’re watching, though, there’s a better than 50-50 chance that it will end less than 10 minutes into the extra frame, and more than a 75 percent probability it will end before double OT. And that’s another sense in which Wednesday’s Blackhawks-Kings game was a rare treat. Based on history, there was only about a 17 percent chance that an OT game between two teams that had been high-scoring in regulation would last 22 minutes before someone scored. It was exciting, unlikely extra hockey, and hopefully we see even more drama in Game 6 on Friday night.